Ireland prop Mike Ross has signed a new contract which will keep him at Leinster until at least June 2016. The 34-year-old has won two Heineken Cups and a Pro12 title since joining the Irish side in 2009. His international debut came in the same year, and the former Munster and Harlequins player has won 44 caps. 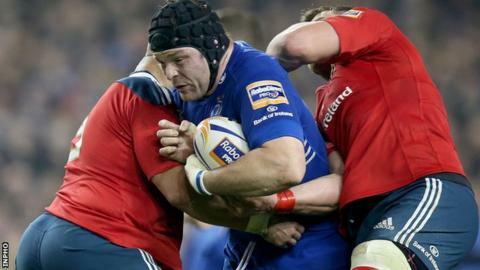 "I am happy to have re-signed with Leinster for another season - it is an exciting time to be involved with both Leinster and Ireland," said Ross. "The next 12 months will be incredibly busy and challenging but also have the potential to be very rewarding too." Ross played in all five games of Ireland's Six Nations Championship success this year. His last appearance for Ireland was in the 26-23 victory over Australia in November. "Mike has made a huge contribution to the Leinster environment since joining us in 2009," said Leinster CEO Mick Dawson. "He continues to be an integral member of our squad and is also playing a key role in the development of emerging talent at the club. "His performances for club and country this season illustrate his value to Irish rugby."